All transactions are safe and secure with a reliable history in online purchasing behind each of our associates. 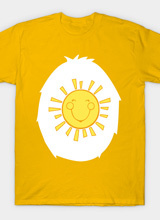 Buy the Funshine Bear Costume t-shirt to own Care Bears clothing and merchandise. This Care Bears tee illustrates exactly what these eighties icons are all about, fun. On it is a recreation of Funshine Bear's belly, complete with the smiling sun logo. If you're the type of person who always tries to look on the sunny side of life too, then this Funshine Bear costume t-shirt will complement your personality well. Perhaps you're a practical jokester too, which sometimes gets Funshine in trouble. In addition to the Funshine Bear Costume tee above, browse the Care Bears Clothing Gallery for more apparel like men's and women's clothes, kids shirts or hoodies.